Studio 10 Entertainment is a fashion company located in Irvine, CA. They offer clients an opportunity to choose from their wide range of affordable gowns or get their own custom made wedding dress. Studio 10 Entertainment is one of the top local bridal boutiques in Irvine that provides professional alterations on wedding dresses, making sure that they not only fit but also look adorable. Apart from tailoring and alterations they also offer inexpensive costume rentals. Having been in the fashion industry for more than 8 years, Ever Pretty Garment knows that the modern woman's life is filled with important events from graduation to weddings and prom to girl's night out. Their store is located at 1881 Kettering, Irvine, CA 92614. Over the years, they have remained true to their original concept of offering unparalleled Irvine wedding dresses in California. With Ever Pretty Garment, you will truly love and appreciate the process of finding the perfect wedding gown. 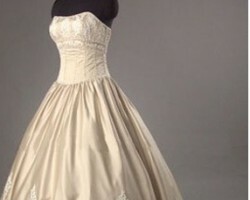 Le Papillon Tailoring and Alterations specializes in custom made wedding dresses in Irvine, CA. With over 20 years in custom dress making, their master tailor is well equipped to design unique wedding gowns that will truly reflect any bride's taste and personality. To create that beautiful dress you've been dreaming of, you simply need to sketch your design and choose your preferred fabric with some expert suggestions from the tailor.